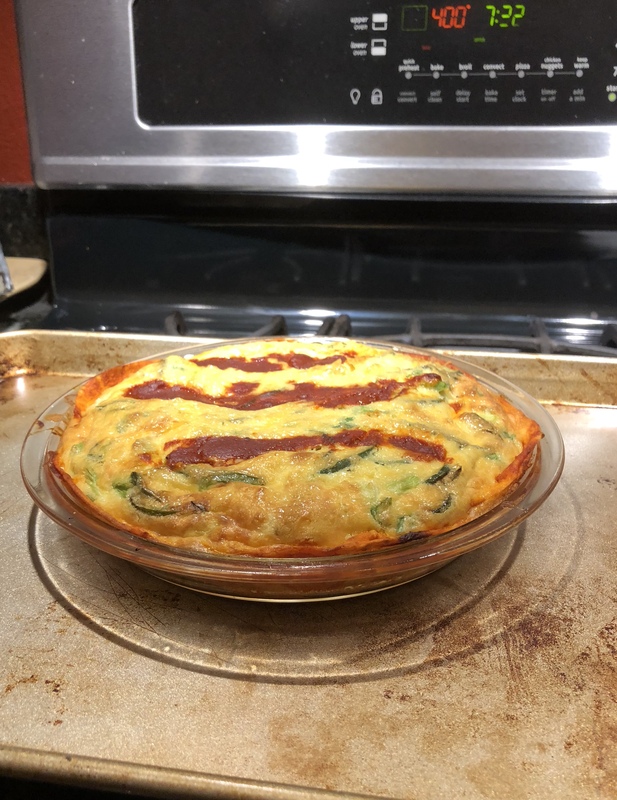 Poblano chiles and lots of eggs, cheese and cream in a tortilla crust accented with red Chile sauce is worth trying. Overlook the old baking sheet and concentrate on the quiche. It is very rich, yet light in texture with tantalizing flavors. Next time out, egg beaters with just an egg or two and half and half instead of heavy cream should work and make it somewhat healthier. The tortilla crust is something worth trying with other fillings. We’ll work on that in the Gringo Gourmet Academy Test Kitchens and report on the trials soon. Preheat oven to 400°. Whisk the eggs, heavy cream ½ tsp salt and a few grinds of pepper in a large bowl. Heat 1 Tbsp olive oil in a large nonstick skillet over high heat. Add the sliced poblano pepper, season with salt and pepper and cook until tender and charred in spots: 5-8 minutes. Add to egg mixture along with scallions and all but two Tbsp cheese, stir to combine and set aside. 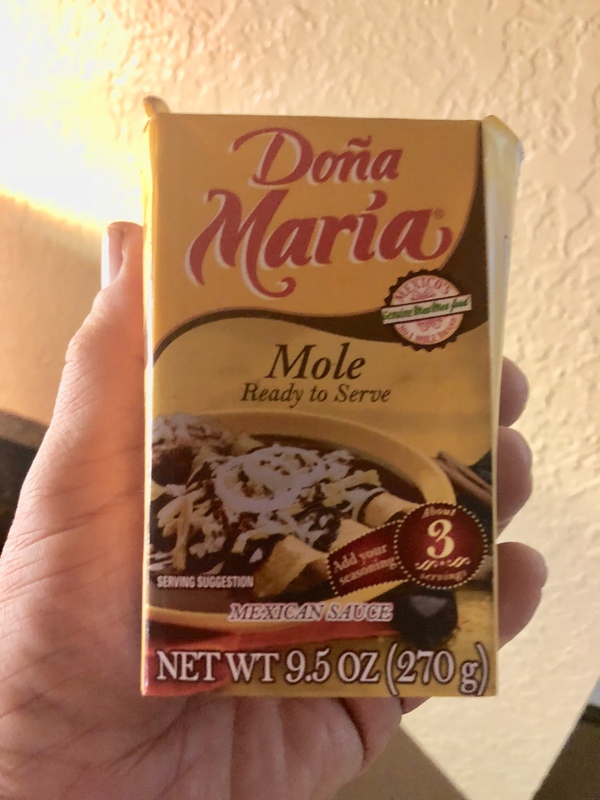 Pour the enchilada sauce into the skillet and heat until bubbling; remove from heat. Using tongs, dip the whole tortilla in the sauce until coated. Place in a 9-inch pie plate. Dip the tortilla halves in the sauce and arrange around the sides of the pie plate with the curved sides up, they will overlap a little. Reserve the remaining sauce. Pour the egg mixture into the tortilla “crust”, smooth out the poblanos in and sprinkle on the remaining cheese. Drizzle with about three Tbsp of the remaining enchilada sauce. Bake until golden, slightly puffed and set – about 25 minutes. Reheat leftover enchilada sauce, cut the quiche into six wedges and plate. 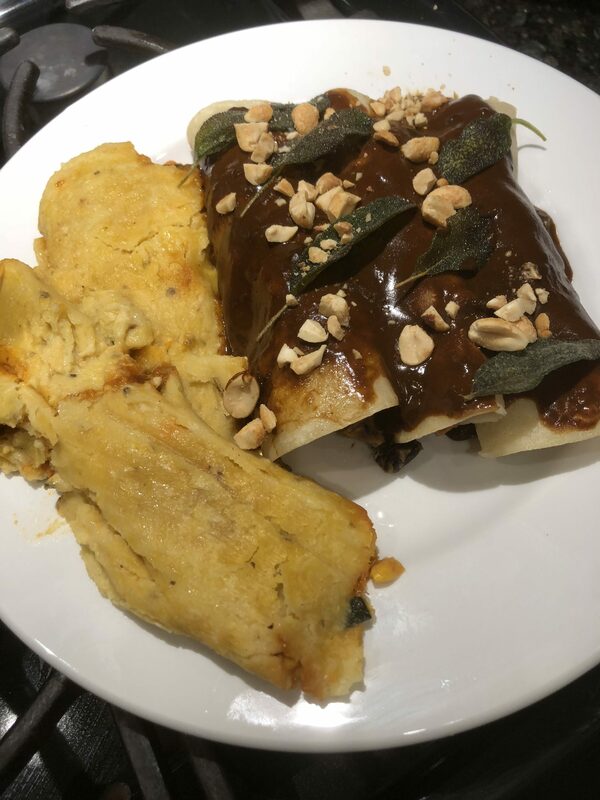 Drizzle with heated enchilada sauce. Serve with a simple tossed salad or the jicama recipe below. Peel the jicama and slice into matchsticks. Toss with lime juice, cilantro, 2 Tbsp olive oil and ¼ cup water. Season with salt and pepper and serve with the quiche. Poke (pronounced poh-keh) is trendy right now. We’re finding poke on menus, in specialty restaurants and even on food trucks. It is raw fish with an assortment of sauces and it is very good! 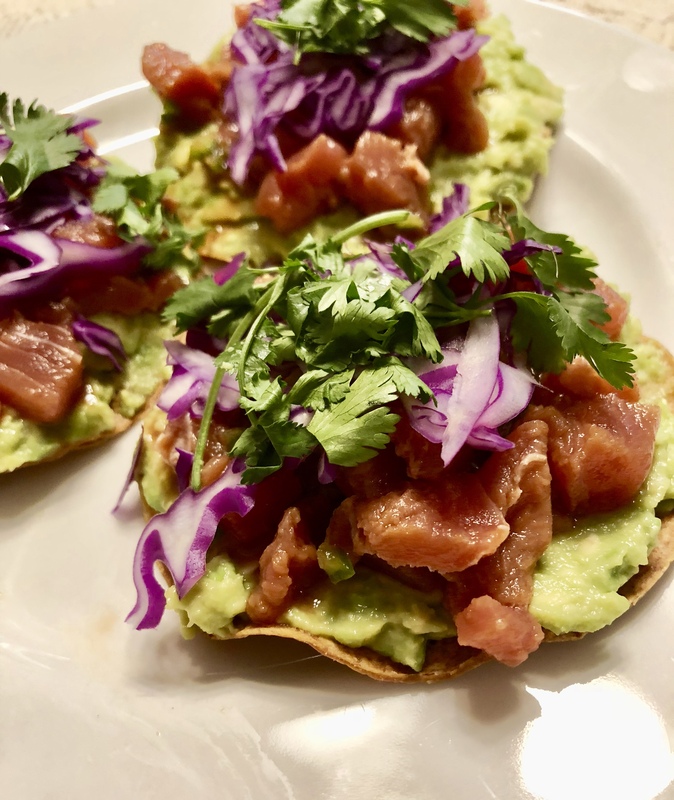 Running across a recipe for a “tuna and avocado tostada” was just another way of enjoying poke with a little Mexican twist, so, por que no? (why not). Toss 12 oz diced sushi-grade tuna with one tablespoon each soy sauce, orange juice, lime juice and 1/2 teaspoon toasted sesame oil. Stem, seed and mince one serrano pepper (two might have been better), and season with salt and pepper. Mash one avocado with the juice of half a lime and a little salt. Spread the avocado side to side on 6 tostadas. Tope with the tuna drizzle with chipotle mayonnaise and sprinkle with shredded red cabbage and cilantro and crispy fried onions. Po’ que poke. Delicious, light and refreshing. Notes: Make your own tostadas by baking corn tortillas in a 375° oven. Spritz the tortillas with a little cooking spray, turn at five minutes a couple of times until they are lightly browned and crisp. You can use 6″ tortillas. I used three 3″ tortillas and heaped on the poke and avocado to make a meal for one. Make your own chipotle mayonnaise with two to three tablespoons of mayonnaise and a teaspoon or so of adobo from a can or jar of chipotles en adobo. Thin with a little water to make a drizzling consistency. I was too lazy to fry onions and didn’t want to buy a whole can of fried onions this time. Maybe nest time! Have the guy at the meat counter get your tuna from the freezer, not the tuna that’s been in the display case for who know’s how long! It will be frozen and easier to dice and better tasting. Remember, you’ll be eating it raw “cooked” by the citrus juices in the marinade. Battered and fried “spicy”shrimp with sides of fries and coleslaw are a wonderful indulgence once in awhile, but you can go low-cal garlic shrimp and potatoes as well. 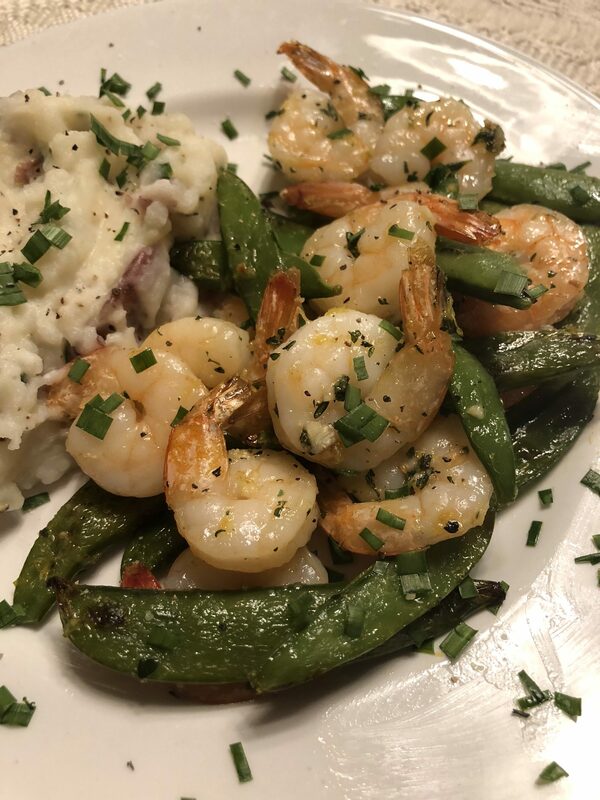 Broiled garlic shrimp and sugar snap peas and a side of potatoes mashed with buttermilk and chives can become another treat without the guilt at 44O calories per serving (including the richness of butter). Using buttermilk in the mashed potatoes was a new experience after years and years of using half-and-half. Buttermilk adds a special touch to the flavor. Thank goodness there were enough potatoes for a small second helping. Think outside the paper box of fried goodness and try this different approach to favorite goodies. Garlic shrimp and potatoes – favorites broiled, not fried. Preheat broiler. Toss shrimp, snap peas, garlic, thyme and olive oil in a large bowl and set aside. Cook potatoes in a pot of water until fork-tender – about 10 minutes. Reserve ¼ cup cooking water, drain the potatoes and return to the pot. Add buttermilk, 2 Tbsp butter, ½ tsp salt and a few grinds of pepper. Mash, gradually adding cooking water if needed. Be sparing with liquids and don’t over-mash. Stir in half the chives. While potatoes are cooking, spread the shrimp and snap peas in a single layer on a baking sheet. Broil until just cooked through and charred in spots – 6 to 8 minutes. Remove from oven, dot shrimp and peas with 2 Tbsp butter, sprinkle on the lemon zest and toss until the butter is melted and the mixture is well coated. Divide potatoes and shrimp mixture among 4 plates. Drizzle with any juices (that would be herbed butter!) from the baking sheet. Sprinkle with remaining 1 Tbsp chives. 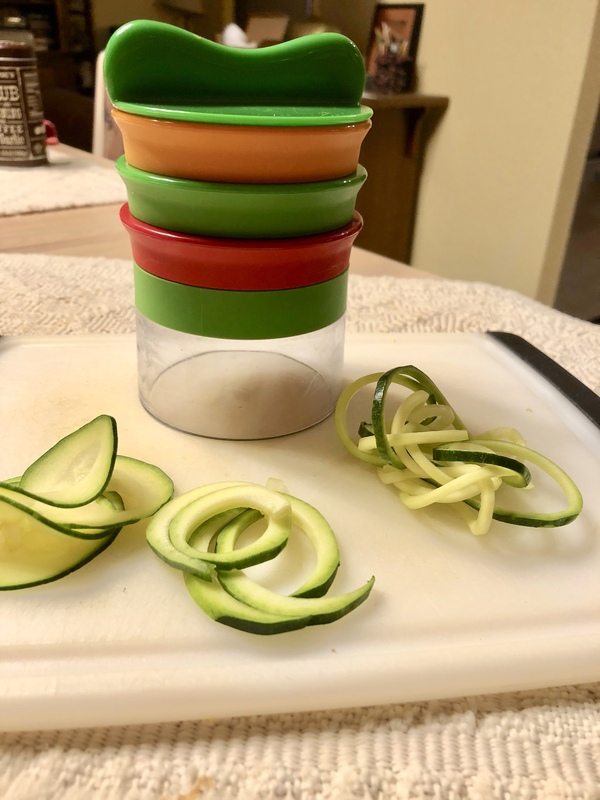 Many fun meals have been made using a small, hand-held, inexpensive OXO spriralizer to make colorful and delicious vegetable “noodles”. It has become more fun with the introduction of a three-blade option allowing a choice of three sizes of noodles. This new toy and discovering a new recipe calling for zucchini noodles made experimenting mandatory. 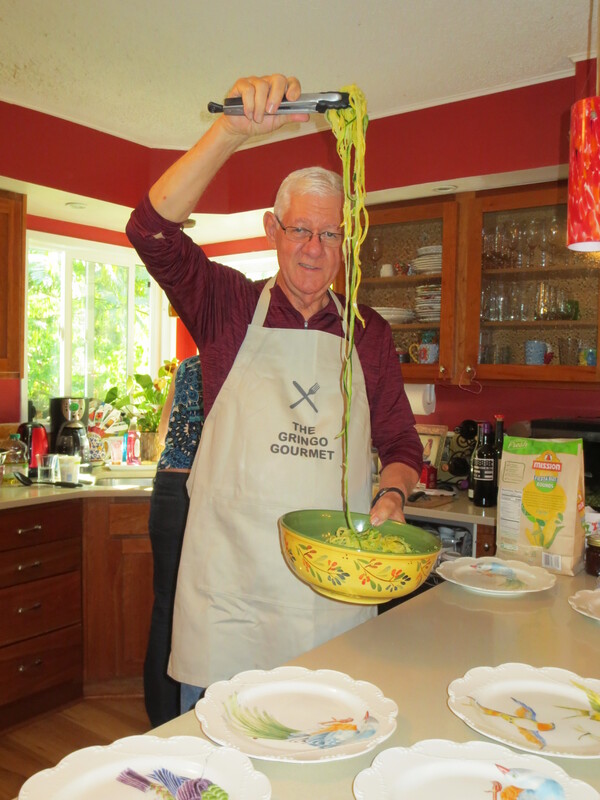 Six-foot long zucchini and yellow squash noodles for Leah’s bridesmaids’ luncheon with the first OXO spiralizer. New OXO serializer with three blades for three widths of vegetable noodles. 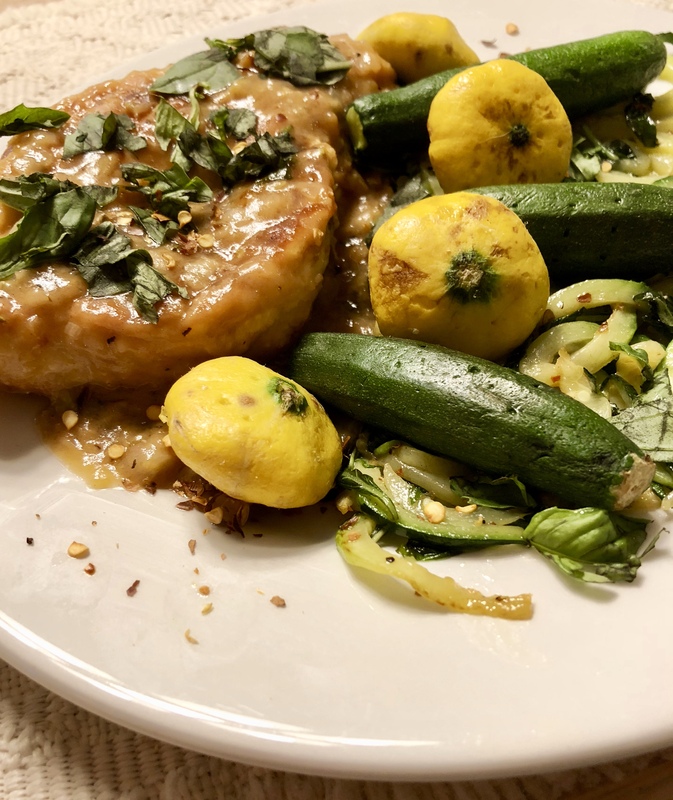 Lemon-Basil Chicken with Zucchini Noodles. Baby patty pan and zucchini squash were irresistible garnish on the zucchini noodles. Spread ¼ cup flour on a large plate. Season chicken with salt and pepper and dredged in the flour; shake off excess flour. Heat oil in a large non-stick skillet over medium-high heat. Add olive oil and heat until shimmering. Add chicken and cook until golden and almost cooked through (5 – 6 minutes per side). Push chicken to the edges of the skillet and add shallot and basil stems to middle of skillet. Cook about 1 minute until soft, but not browned. Stir in remaining tablespoon flour and cook 1 minute to make a roux. Add chicken broth and lemon juice, bring to a boil while scraping up any browned bits. Reduce heat and simmer, turning the chicken occasionally until cooked through (165°in thickest part of breast) and sauce is thickened (3 – 4 minutes). Turn off heat and swirl in 2 tablespoons butter until melted and add the lemon zest. Season with salt and pepper. 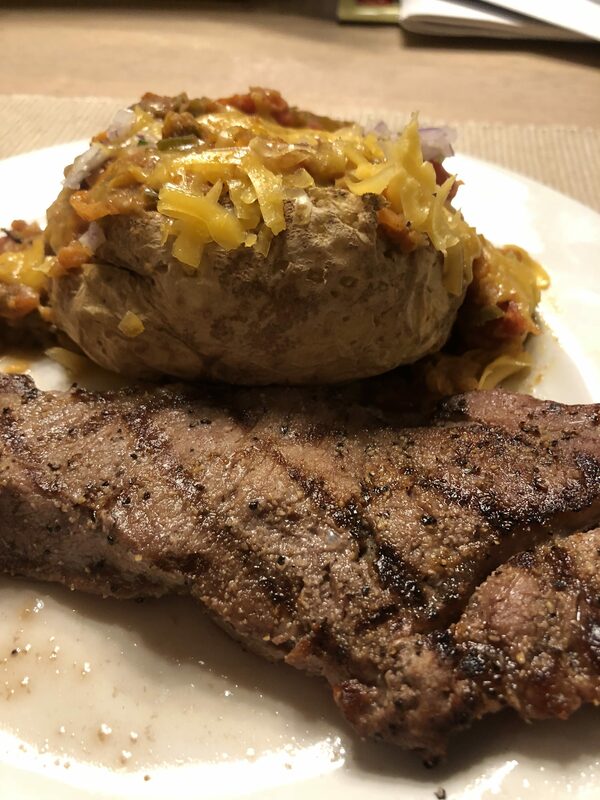 Melt the remaining tablespoon butter in a large non-stick skillet over medium heat. Add the zucchini noodles, season with salt and pepper and cook, stirring occasionally until just softened (2 – 3 minutes). It is easy to overcook the noodles and make them too soft! Toss in half the torn basil. Divide among 4 plants, top with chicken, sauce, remaining basil and red pepper flakes. Long ago, The Gourmet Dad, by Dean McDermott, caught my attention on a Denver bookstore shelf. 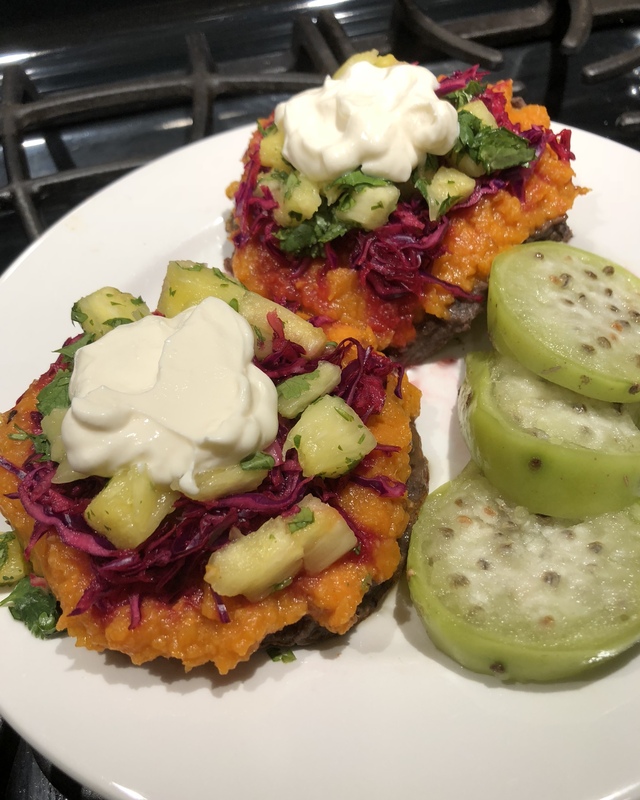 It promised “Easy and Delicious Meals the Whole Family will Love.” It had great recipes that included modified versions to appeal to children. A surreptitious photograph of book cover was taken to remember to look at the book in more detail after the trip. Stumbling on that photo a couple of years later prompted a visit to Amazon and subsequent purchase of the electronic version of the cookbook. It does have some very good grown up recipes; even the kid versions sound good. The books photos attest to the plating skills of an accomplished professional chef and inspire emulation. McDermott has a wife and five children which seems to a cadre of sous chefs in the house to help with the prep of the books “easy” meals. There are no quibbles with the “delicious” description. The below recipe with the Fennel F-word begged to be made. Seared scallops with it made it imperative! As a single empty-nester with no sous chests around, prep for most recipes takes some time. This recipe was worth the time on multiple levels. As a desert dweller, using watercress was a new adventure well worth the price for a handful. Who knew it has a peppery bite! It is always a thrill to try something new. McDermot’s instruction on searing scallops is simple and produces beautiful results. Gaining a new skill is always appreciated. McDermott’s original recipe is for four salad servings topped with two scallops each. Hah! 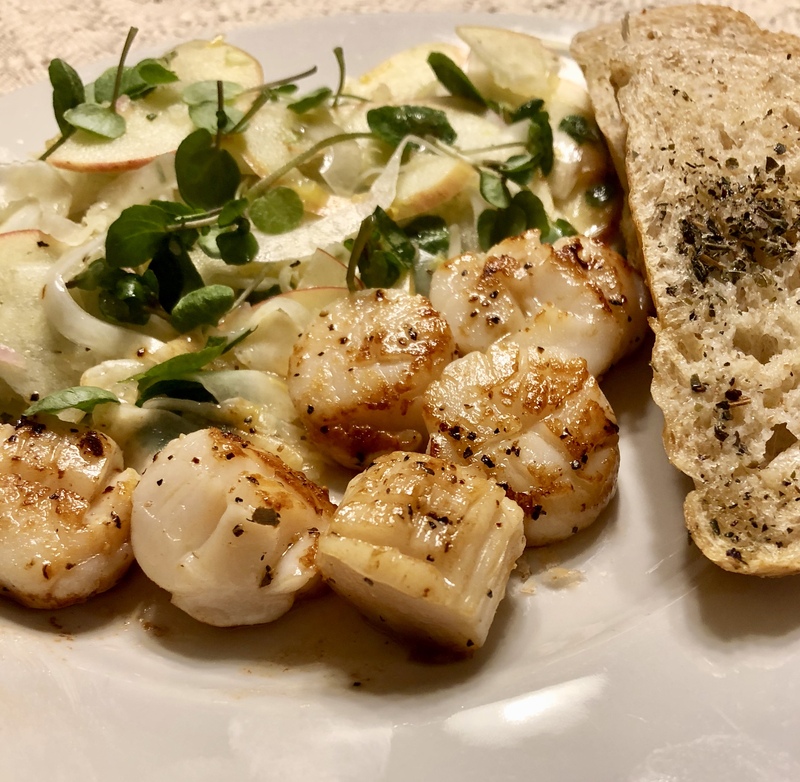 Reducing the volume of apple and fennel and upping the count of scallops to six per serving and the addition of a little garlic and herb bread made in a meal instead of a side dish. No point on shorting oneself on scallops, or fennel! A bonus was some leftover roasted shallot vinaigrette for another evening. Seared scallops and apple and fennel salad justify the use of the F-word FENNEL!!! Spread shallots on a baking sheet. Drizzle with 2 Tbsp of the olive oil and season with salt and pepper. Sprinkle with the thyme and two springs’ worth of the rosemary. Roast the shallots until tender, 10 – 12 minutes. Allow the roasted shallots to cool, then mince them. Combine them with the remaining rosemary, orange juice, lemon juice and zest and garlic in a small bowl and mix well. Whisk in the remaining ½ cup olive oil and season the vinaigrette with salt and pepper. Pat the scallops dry and allow them to come to room temperature. In the meantime, combine the apple, fennel, lemon juice and lemon halves in a medium bowl and set aside. Preheat a large sauté pan over high heat. Using a sharp knife, carefully score the top of each scallop in a crisscross pattern and season both sides with salt and pepper and a drizzle of grapeseed oil. When the pan is hot, carefully place the scallops in it with the crosshatched side down. Do not move the scallops until they release from the pan, about 3 – 4 minutes to get the best sear and coloring. Once the crisscross side releases and is a golden brown, flip the scallops and add the butter. Once the butter has melted, baste the scallops a few times and then remove the pan from the heat. Residual heat from the pan will finish cooking the scallops to perfection. Drain the reserved apple-fennel mixture and discard the lemon halves. In a large salad bowl, toss have the watercress with the fennel-apple mixture. Add the reserved vinaigrette and 1/8 cup of the crushed hazelnuts and toss gently. Season with salt and pepper. Arrange the salad on four salad plates, and top each with two scallops. Scatter the remaining watercress on top and garnish with the remaining hazelnuts and serve. Notes: I forgot to buy hazelnuts, so I didn’t use them this time. I wonder how pecans might work instead. The garlic cloves I uses were quite strong, but mellowed nicely in the dressing as it sat on the counter for a few minutes. 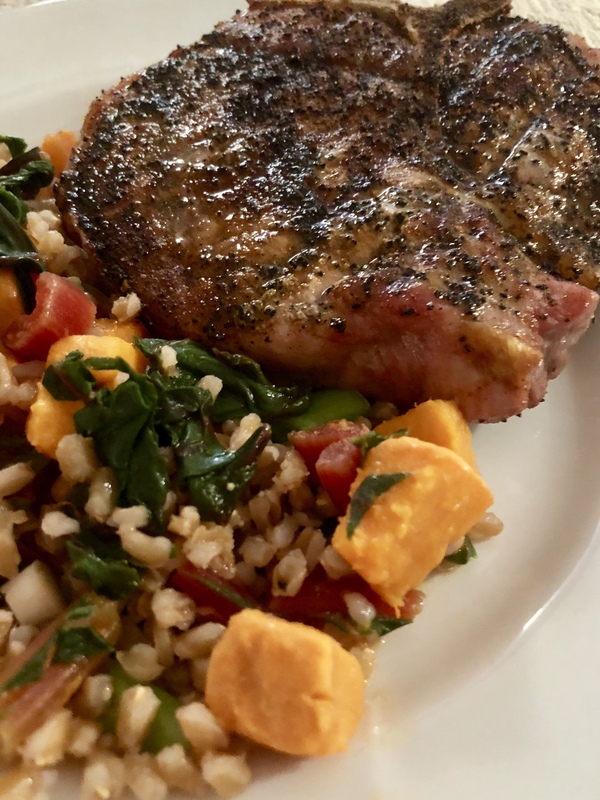 The “3 Ways to Use Chard” feature in Cooking Light magazine has been the source of some great meals over the past several days. Chard with Shaved Fennel started the binge. Fennel is always a siren’s call around here. Then came Charred Chard and Shallots, just because it was fun to say out loud and charring greens in the oven or on the grill is a taste treat that keeps greens interesting. Completing the trifecta was a Sweet Potato and Chard Salad. The clincher on that one is farro. It wouldn’t be honest to say the chard binge is over. There’s another bunch in the crisper awaiting another chard challenge. 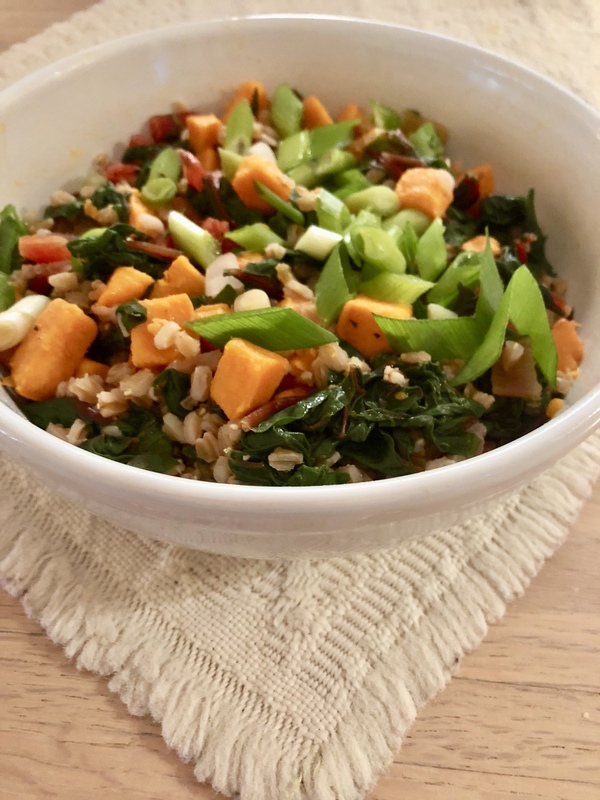 Sweet Potato and Chard Salad with a sprinkle of scallions. 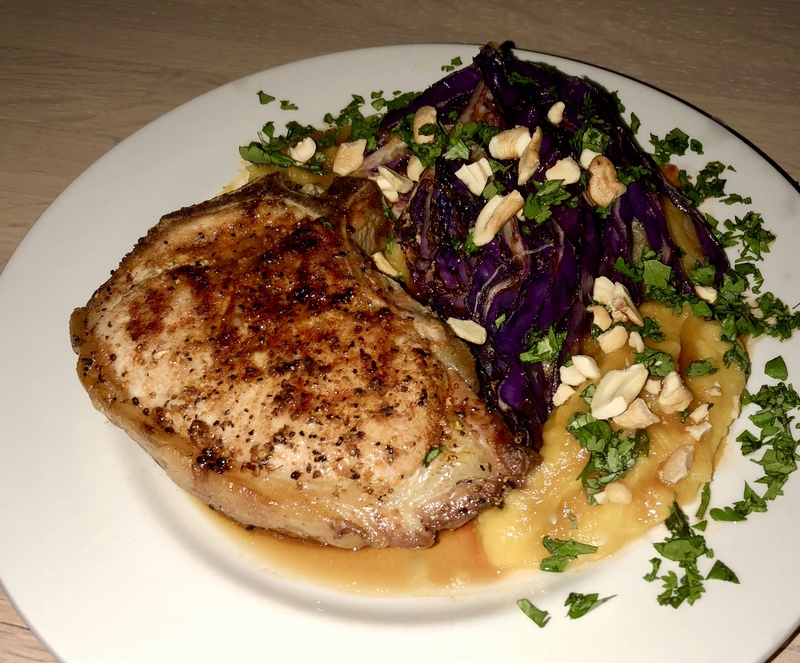 The salad was just right with that second pork chop from the package! 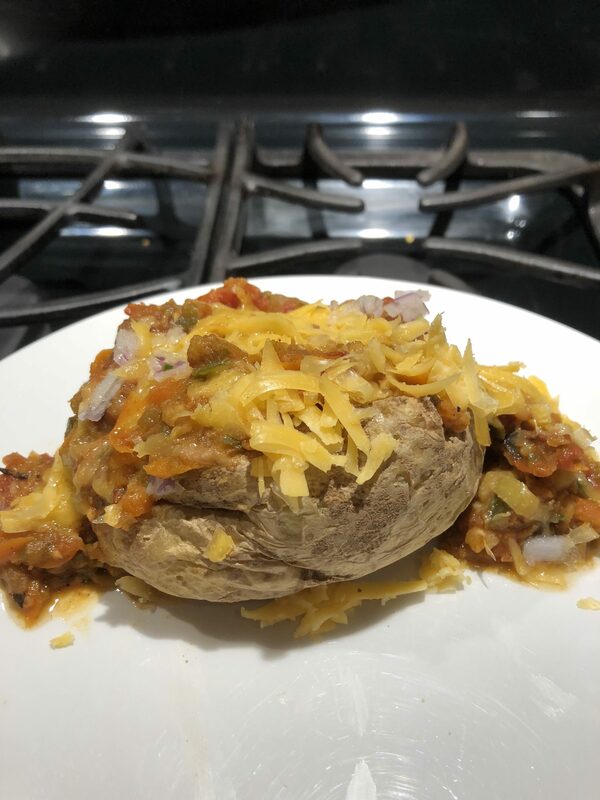 Cook sweet potato in 4 cups water over medium-high heat. Bring water to a boil and reduce to medium low for three minutes. Stir in chopped chard and cook until wilted, about 2 minutes. Drain well. Combine potatoes and chard, the cooked farro, olive oil, vinegar and salt and pepper. Toss well to combine. Sprinkle with sliced scallions. This salad will be a hit at the next potluck dinner gathering. Follow package directions for cooking farro. You can put the farro and water in the refrigerator overnight to soak and reduce it’s cooking time. This works with steel cut oatmeal, too. The texture and nutty flavor of farro made this salad extra special. Good ol’ El Paso groceries… it took shopping in three stores to find tarragon vinegar. The Heinz tarragon vinegar was a disappointment. It was very weak and not really vinegary nor was there much tarragon flavor. Even with more than the recipe called for, it was sad. Next time I’m out of town, I’ll search for a more potent brand.